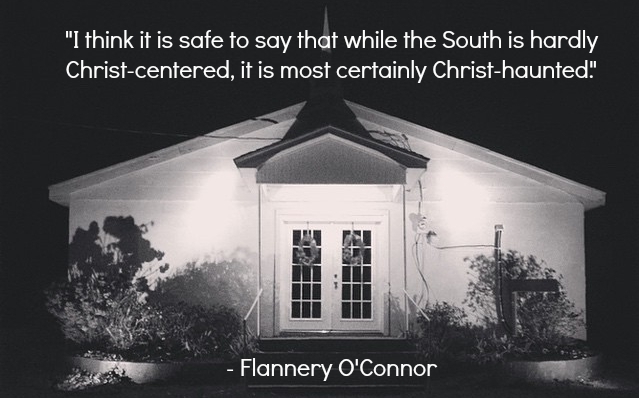 Flannery O’Connor once said that while the south is hardly Christ-centered, it is most assuredly Christ-haunted. I thought that that was such a profound statement especially considering what part of the south I’m from. I live close to Russellville, Arkansas where there are roughly 120 churches. There is practically a church on every corner, and yet our town doesn’t seem very Christ-centered. Of course, it’s easy for us to look outside the four walls of our church and see how morally bankrupt the rest of the world is, but what would we see if we looked in our own hearts? Will we find that are hearts are Christ-centered or Christ-haunted? Are we actively living our faith or are we simply ghosts, remnants of what used to be? For the last couple of months, I’ve been doing a slow read through the book of Revelation and every once in a while it seems like the Holy Spirit will poke me on the shoulder and say, “Pay attention, I’m talking to you” and when He does I soak in the passage and I am drawn closer to Christ through an outcry for repentance. And that sounds all warm and fuzzy, but it’s not. It’s painful. I think sometimes I make it more painful than it has to be. I don’t know about you, but I find myself in a rush trying to be holy NOW, and then I end up messing up again. I want to hurry to do enough ‘holy’ things to make up for the sinful things I’ve done, but the reality of the situation is that my sin was already paid for by the blood of Jesus. So, what must I do? Listen. Notice the last words of Jesus in this passage, “Let anyone who has an ear listen to what the Spirit says to the churches.” So, what will I hear if I listen? His voice telling me to “remember what I’ve received and heard and to obey it.” So, did I receive and hear? The Gospel. The good news that Jesus came to save sinners like me. How do I obey it? By repentance and belief. I must repent of my sins and believe that God raised Jesus from the dead to declare victory over all sin. If I listen closely to what the Spirit saying, I can also hear Him telling me to wake up. One of my favorite passages is found in the book of Ephesians, and it says, “Sleeper, awake! Rise from the dead, and Christ will shine on you.” Paul quotes from an old hymn of the first century Church that alludes to Isaiah 26:19 which is a promise of God to His people that their dead shall awake from their slumber, and one stanza of that particular verse says, “O dwellers of the dust, awake and sing for joy!” The Holy Spirit is telling us that the time for taking a spiritual dirt nap is over! We must come alive, see the glory of God, repent and be saved, be sanctified, and be filled with the Holy Spirit!